The first thing that comes to mind whenever I hear the word “Guimaras” is mangoes. Guimaras Mangoes are dubbed as the world’s sweetest fruit. I have not really tasted Guimaras Mangoes until I have set foot on the island and stayed in Nature’s Eye Beach Resort last month. And I must tell you that Guimaras Mangoes are the best mangoes I have ever tasted… taste bud delight, if I may add. You see, I am from Pangasinan and we have mango trees in our yard. Hence, mangoes, when in season, are a mainstay around the family table. Suffice to say that I know my mangoes. LOL. Other than knowing about Guimaras as the Mango Capital of the Philippines, I have always been curious about this island down south especially after news broke out on August 11, 2006 about an oil tanker that sank off the coast of Guimaras causing what is considered today as the worst oil spill the country has ever had. 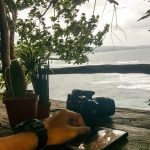 Twelve years later, who would have thought that I would have the privilege of exploring Guimaras? 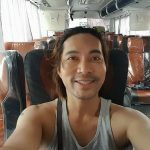 On August 12, 2018, I took the first boat trip out of Carabao Island to Caticlan to board a Ceres Bus to Iloilo. 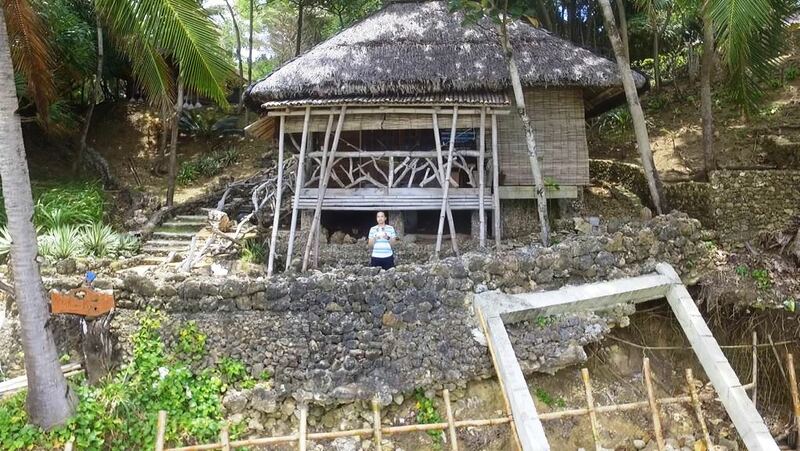 Click here to read about my visit to Carabao Island, Romblon. The bus ride from Caticlan to Iloilo took about 6 hours because of slow traffic. I did not really mind the long ride because it was such a scenic route. Also, I needed to catch a few winks to regenerate for Guimaras. Hence, I slept most of the time throughout the trip and woke up only at bus stops- Kalibo and Passi. 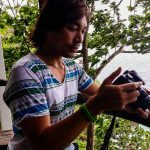 I traveled with fellow travel blogger Cai Dominguez of Travelosyo who is also the Resort Manager of Nature’s Eye Beach Resort in Guimaras. 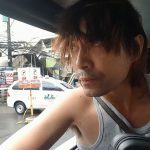 He quit his corporate job in the bustling Metropolitan Manila to live a more meaningful life on the island. 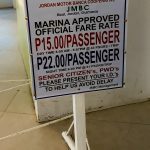 Upon arrival at the Ceres Bus Terminal in Iloilo City, we took a couple of rides more, a jeepney and a tricycle, to get to the Guimaras-Iloilo Ferry Terminal. 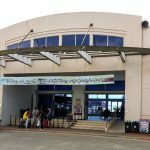 The Guimaras-Iloilo Ferry Terminal is the gateway to Guimaras Island. 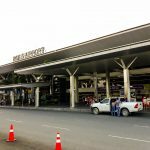 So if you are coming from Metro Manila, you need to book a flight to Iloilo. In our case, we traveled by land from Caticlan to Iloilo. Other do-it-yourself travelers whom I met in Guimaras traveled by sea to Iloilo from Bacolod for 2 hours. 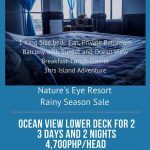 A boat trip from Cebu takes about 14 hours and a boat trip from Manila takes about 27 hours. Senior Citizens and Persons With Disabilities may avail of discounted rates upon presentation of proper identification. I must say that I was quite impressed with the Guimaras-Iloilo Ferry Terminal. It was spacious and orderly. It had good air-conditioning and efficient lighting. Boat trips to and fro Guimaras are frequent. Usually, a boat leaves every 15 minutes. The last trip to Guimaras is at 8 PM while the last boat leaves Guimaras at 7 PM. Our boat trip from Iloilo to Guimaras was on schedule and took only 20 minutes. 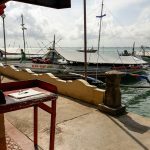 The boat docked at the Jordan Guimaras Jetty Port upon arrival in Guimaras. We have been traveling close to 8 hours in total since we left Carabao Island. I was close to exhaustion (yeah, coming from someone who slept throughout the whole trip). I tried convincing myself that this long trip had better be worth it. I mean… a destination this hard to get to must really be awesome, don’t you think? 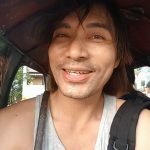 We rented a tricycle for Php 500 to take us to Nature’s Eye Beach Resort instead of riding a regular public utility jeepney. I had too many pieces of luggage with me anyway and told Cai that I did not want to inconvenience the other passengers (or me, LOL). 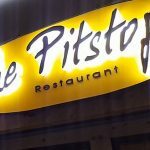 On the way, we passed by The Pitstop Restaurant to get the famous Mango Pizza. 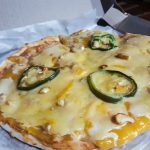 The 9-inch Mango Pizza cost P240. One of the Ficus Trees that abound in Nature’s Eye Beach Resort. I rode at the back of the tricycle with my drone and luggage. 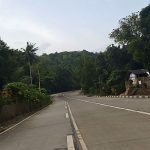 Guimaras has paved highways and not too many people by the roadside. Not too many vehicles plying the road either. I guess most of them were already in their houses as it was already beginning to get dark. Twenty minutes before reaching Tando, it was already pitch dark and all I could hear was the revving of the tricycle. I could also already smell the beach. When we reached Tando, a Nature’s Eye Beach Resort staff was waiting for us and helped me with my luggage. 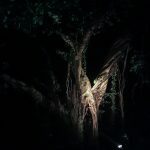 With our cellphones serving as flashlights, we hiked for a good ten minutes to reach the gates of Nature’s Eye Beach Resort traversing what seemed to be a forest. 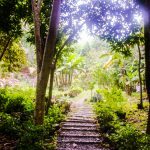 The path to Nature’s Eye Beach Resort. We trekked through mud. I could feel the undergrowth brushing against my ankles, too. I could hear crickets and the ebb and flow of the waves of a nearby beach. I willed my eyes to adjust to the dark surroundings so I could see what I was hearing but to no avail. I just let my vivid imagination to take over. 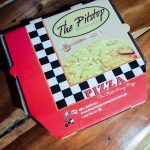 We went straight to the main reception and dining cottage where the owner, Ms. Rowena Amancio, was waiting. She warmly welcomed me to her resort. Over dinner, she shared to me how she started the resort. I learned that she used to live and work in Switzerland for the longest time. During one of her vacations in the Philippines some years ago, she came to visit Guimaras and went island hopping. That was when she discovered this serene area by the cliffs overlooking the sea. In 2014, she decided to build her retirement nest and later on with only two cottages she opened the resort to the public. Fast forward to 2018, Nature’s Eye Beach Resort already has five cottages and is the number 1 resort on Guimaras Island per Tripadvisor. It is the perfect place for that once in a while getaway with your significant other. Privacy is high. Hospitality is warm. Service is customized. Avoid staining our bed sheets and towels. Take good care of our home and things. We do not have wi-fi, talk to each other pretend it is 1995. No smoking, eating and drinking inside the room. 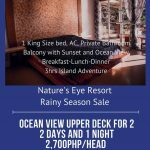 For bookings, visit Nature’s Eye Beach Resort’s Facebook Page here or call +63-907-7579055. After dinner, it was time to call it a day. I was billeted at the Cliff Top Cottage. From the reception cottage, I had to go down some 200 or so steps and climb up another 50 or so steps to get to my room. It was windy when I got to the veranda of my cottage but I could not really see any of the surroundings apart from the cottage itself. I reckoned that the beach must be nearby. I fell as asleep listening to the waves hitting some rocks and the rustling of the leaves in the trees as they danced with the wind. It was that time of the year when habagat or south wind was at its mightiest. I had a good night’s sleep just the same. 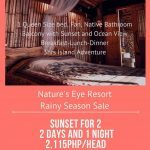 When I woke up in the morning, only then did I realize that I have certainly hit the bull’s-eye with Nature’s Eye Beach Resort! I was so sleepy last night that I did not appreciate how sizable my room was. It was big enough for a family of four. The mattress and pillows were comfortable. The bed also came with a pull-out. When I stepped out of the room, lo and behold, the view was to die for with the veranda overlooking the ocean. Between me and the cliff were two branches of trees made into terrace railings. It was such a beautiful sight to greet my first morning in the resort! The view was so inspiring that I thought if I were a novelist I could actually write a whole novel here. Just peace and quiet. Instantly, I fell in love with the place. The next logical thing to do was for me to get my camera and take lots of photos and selfies. The veranda was my second most favorite part of the Cliff Top Cottage. 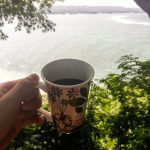 It served as my me-time spot in the resort where I regrouped myself and planned for the next move in my life. You see… I have been contemplating for the longest time if I should go on with travel blogging or go back to doing a routinary 9 AM to 5 PM (most of the time 11 PM) work schedule. I guess this time, it is still passion over money. 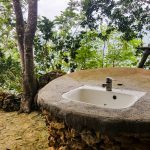 Adjacent to the veranda was the toilet and bath or native bathroom… my most favorite part of the Cliff Top Cottage. They do not call it native bathroom for nothing. It did not have walls. You can do numbers 1, 2, 3 and what have you while staring at the big blue sea. I guess the only downside was the low water pressure in the shower. Having a cottage perched on top of a cliff would certainly weaken the flow of water without an electric pump to boost it . I guess the resort management knew about this already because the native bathroom came with a pail and a dipper. Oh, let me not forget to mention that I loved their organic shampoo and shower gel. 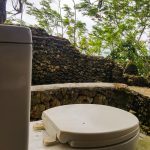 Being true to the resorts eco-tourism advocacy, they only use organic toiletries. After doing my morning rituals, I got a text message from Cai to proceed to the dining area for breakfast. The five-minute walk from my room to the main cottage was not so tiring at all. 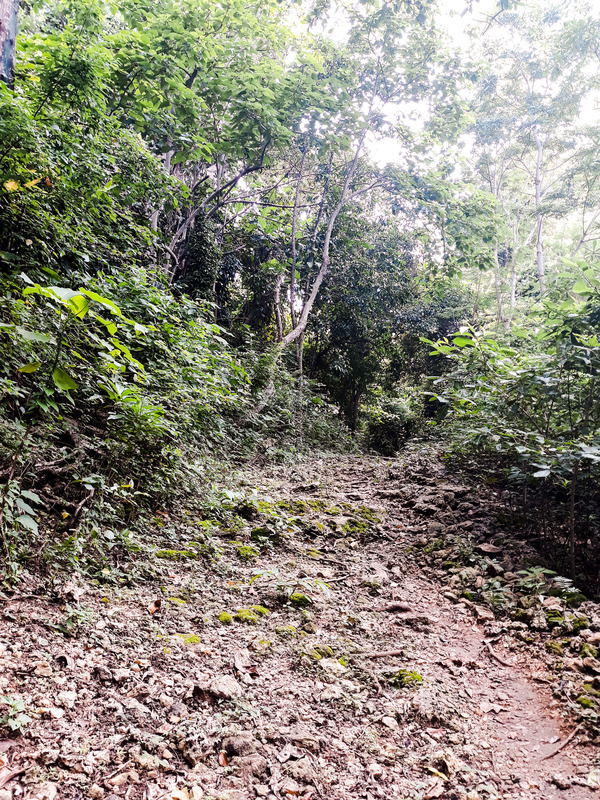 The pebble-covered path through the thick foliage seemed more of a treat to me than torture. 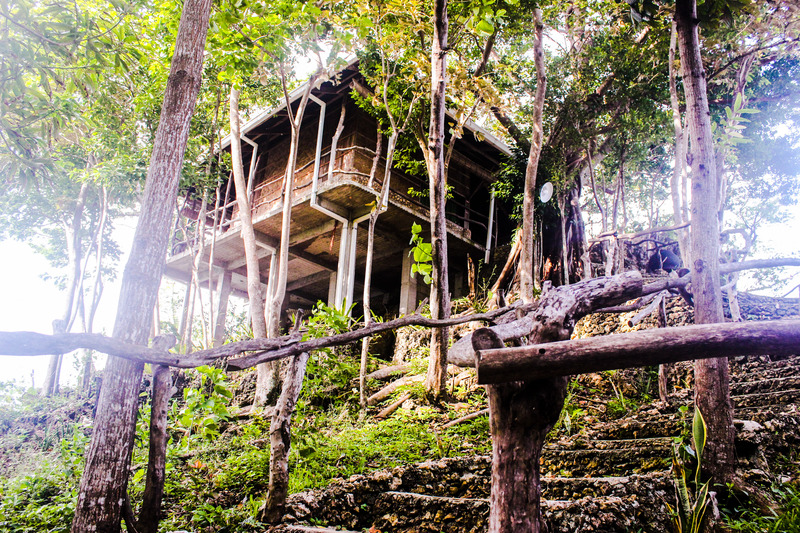 The main cottage was breezy and had a perfect view of the Guimaras Marine Sanctuary. I must say that my coffee never tasted so good. That view and my cup… just the perfect blend. I also checked the resort’s Sunset Cottage. For obvious reasons, this cottage was facing the west and had the perfect view of the sunset. No one was billeted in the cottage so I stayed at the balcony and waited for the sunset. Be ready to see lots of hermit crabs patrolling the grounds of Nature’s Eye Beach Resort. 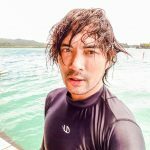 I also went on an island hopping activity to visit the nearby islets of the Guimaras Marine Sanctuary. The resort can arrange this for you. 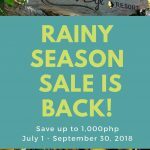 In fact, it is already included in their Rainy Season Sale. The boat’s pick-up point was a good ten minute walk from Nature’s Eye Beach Resort. On regular days, the boat can pick up the guests from the resort’s beach front. On the way, we passed by two small villages. The swimming area was enclosed by a net for safety. The water level was about 5 feet deep. I was told that during summer, the water level is lower (about waist deep) and safe for children to swim. The tide was stronger than usual. I was told though that the waves were manageable. I was glad we pushed through because I wanted to see for myself if the Taklong Island National Marine Reserve has already recovered from the damage brought about by the oil spill. After braving the strong waves of the open sea, we sailed through mangroves where the clear water was still. 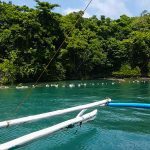 The Taklong Island National Marine Reserve in Nueva Valencia, Guimaras, composed of 46 islands and islets, is home to various species of birds, marine creatures and other animals. The mangrove is 53 hectares. From what I saw, the Taklong Island National Marine Reserve may be on its way to full recovery from the damage brought about by the oil spill twelve years ago. Unfortunately, it is not spared from humanity’s complete disregard of nature. Sadly, from the boat, I could see plastic bottles floating by. When we checked, most of the discarded mineral water bottles came from neighboring countries Malaysia and Indonesia. The current apparently has brought them here to stay. I hope that all (and not just tourists) be more responsible in disposing their wastes. We only have one planet. Selfie with Ms. Rowena Amancio, owner of Nature’s Eye Beach Resort in Guimaras. Our first stop was the Taklong Island National Marine Reserve Eco-Park Office. The eco-park, composed of 46 islands and islets, is home to various species of birds, marine creatures and other animals. The mangrove is 53 hectares. I was not allowed to fly my drone in the eco-park. Besides, the wind was too strong anyway. So, after paying the environmental fee of Php 30, we headed immediately to the nearby tower to get a good 360-degree vantage point of the eco-park. On our way back, we stopped by the Floating Cottage Sandbar . 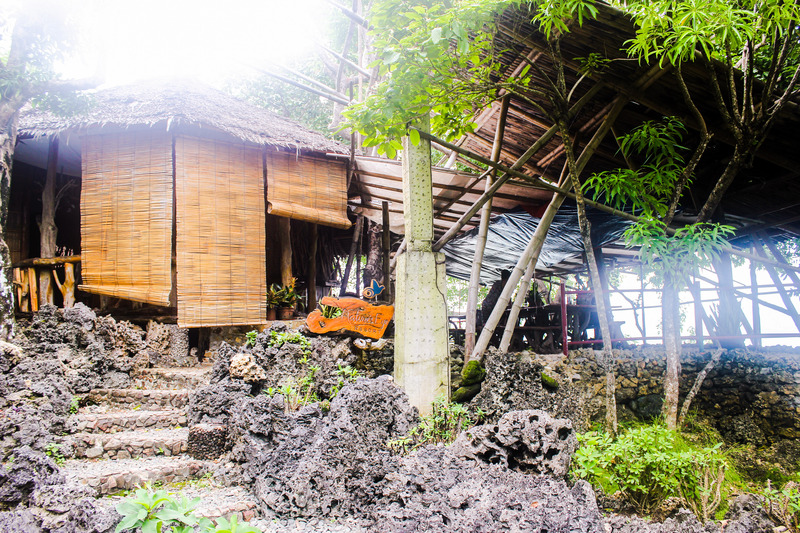 These two large nipa huts were built on a submerged sandbar in December 2015 through the help of Gina Lopez whose family hails from Guimaras. We paid an entrance fee of Php 50 per head. Tables and chairs were available for the guests to lounge and relax. Some guests brought packed lunch and were eating when we arrived. Smoking and drinking of alcoholic beverages were not allowed. The swimming area was enclosed by a net for safety. When I went in, the water level was about 5 feet deep. I was told that during summer, the water level is lower (about waist deep) and safe for children to swim. We did not bring any food. So after an hour of swimming, we decided to head back to the resort. Back on the mainland of Guimaras, we visited the Tan-Luc Snorkeling Site near the boat’s drop off point. Well, it was not the best time to go snorkeling because of habagat but I had a good dip nonetheless. Thanks to Ms. Rowena Amancio, Cai Dominguez and the whole staff of Nature’s Eye Beach Resort for welcoming me like family. See you soon and keep in touch. We have got only one life. Never stop exploring the world one island at a time. Signing out for now. Peace!